We lose patience waiting for someone else to destroy a dangerous piece of ordnance. Every dry season since 2013 I’ve seen this bomb casing in a village near our camp. It’s not that the responsible team was too busy to destroy the dangerous, intact “booster”. 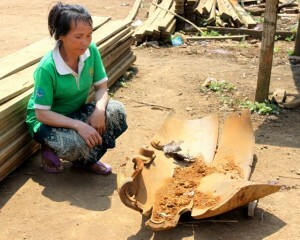 In fact, they refused to make the casing safe until the villagers agreed to give them the casing to sell as scrap. Several years back I watched child scrap collectors use rudimentary metal detectors to search for bomb fragments that they could sell to garner spending money. The kids’ behavior around unexploded ordnance was reckless and, like most youths around the world, they defined an accident as “something unfortunate that happens to other people”. After several hours, I told my friend Yai, “Let’s get out of here before somebody blows us up”. Two weeks later I was back in that village to meet with the parents of two teens who were killed days earlier when they attempted to scrape mud off an odd device they found but couldn’t identify. What killed the two boys was a “booster” from inside a large, aircraft-delivered bomb. As the term implies, a bomb’s booster (not much larger than a soda can but filled with high explosive) is intended to detonate along with the bomb’s nose fuse and contribute to the detonation of the canister’s main charge. Ever since that accident I’ve been well aware of the damage a booster alone can inflict and, whenever I encounter a seemingly empty bomb casing, I check to see if one might be lurking within. I’ve been rewarded a surprising number of times. Three years ago, in Dak Ran village, I spotted a fractured bomb casing with a dented but intact booster — it looked, perhaps not innocent, but far from sinister. Knowing the danger that the device posed should someone tamper with it, or a grass fire heat up the casing, I immediately referred the bomb to the organization tasked to destroy dangerous items in or near that village. Three years after my referral, I happened upon the same bomb sitting in the same village where I’d encountered it previously. When I asked villagers whether any staff from the responsible organization had inspected the device they told me that deminers had visited, but had refused to destroy the booster unless the man who claimed the casing renounced ownership. 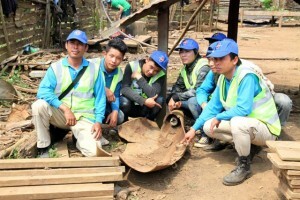 (The deminers’ intent was to destroy the booster and then truck the empty casing to the local scrap yard, sell it, and pocket Lao currency equal to twenty or thirty US dollars). We grew tired of seeing villagers living in harm’s way so we arbitrarily broke the impasse. We destroyed the booster and returned the casing, now safe to sell as scrap, to the family who originally found it. One could quibble over who was most responsible putting people of the village at risk: the deminers for being greedy for pocket money or, the farmer for being…well…come to think of it…equally greedy for pocket money. The sad reality is that, often, responsible parties like the farmer and the deminers escape injury while some innocent soul is killed as a consequence of standing in the wrong place at the wrong time. Yesterday, we broke the impasse. We didn’t ask anyone’s permission; we didn’t bargain. We showed up unannounced, gingerly lifted the casing onto the bed of our pickup and slowly, carefully trucked it into the countryside. Then, we slapped a wad of C4 high explosive onto the booster, retreated a few hundred meters and blew it to bits. We then loaded the casing back in our truck and returned it to, perhaps, the most bull-headed farmer in Sekong Province. Did we reward a stubborn farmer for putting his neighbors at risk? Frankly, Scarlet… (Sometimes, I simply lack the patience to ponder moral imperatives).